Stock photo of a winter landscape with Mount Chephren and Waterfowl Lake after fresh snowfall, Icefields Parkway, Banff National Park, Canadian Rocky Mountains, Alberta, Canada. 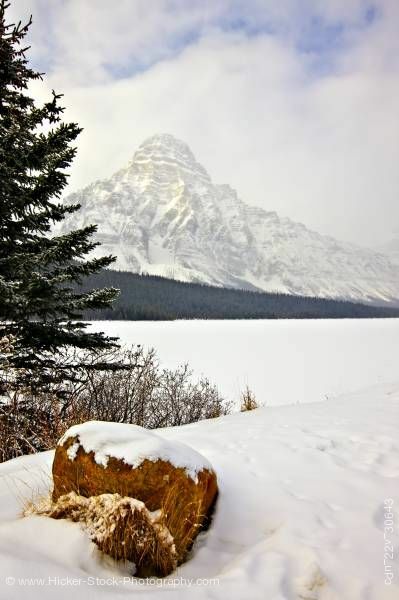 This stock photo shows a winter landscape with Mount Chephren (3307 metres/10850 feet) and Waterfowl Lake after fresh snowfall, Icefields Parkway, Banff National Park, Canadian Rocky Mountains, Alberta, Canada. Banff National Park forms part of the Canadian Rocky Mountain Parks UNESCO World Heritage Site. Mount Chephren was named after Chephren, the pharaon. The mountain was originally named Pyramid Mountain in 1897 by J. Norman Collie, but it conflicted with an identically named peak in Jasper National Park, so it was renamed in 1918. Towering over the Lower Waterfowl Lake, the steep, cliffs of Mount Chephren are most impressive as they rise 1600 metres above the valley floor. The lower part of the mountain is made of reddish and pinkish quartzites of Lower Cambrian age. The higher levels are made of younger, grey limestones. Mount Chephren is a landmark in the Mistaya Valley, not only because of its height and distinctive shape but also because it is positioned somewhat to the northeast of the other peaks that form the southwest side of the valley. This enables it to be seen for a considerable distance from both the upper and lower Mistaya Valley.